Which Small-Cap Biotech Has The Most Comprehensive, Yet Undervalued Immunotherapy Platform In Development? The National Cancer Institute (NCI) spends upwards of $4.9 billion each year on cancer research. While the larger research entities like NCI get all the press coverage and media attention, it's the smaller highly specialized organizations working behind the scenes that are the real heroes. In biotech's immunotherapy sector alone there are emerging names like Galena Biopharma (NASDAQ:GALE) with a Market Cap of $242M trading at $2.05/share, Lion Biotechnologies Inc (OTCMKTS:LBIO) Trading at $6.39/share with a $175M Market Cap, Inovio Pharmaceuticals (NASDAQ:INO) with a market cap of $686.13M and a share price of $11.36/share, Northwest Biotherapeutics (NASDAQ:NWBO) which trades at $5.26/share and a $324.95M Market Cap and Dendreon Corporation (NASDAQ:DNDN) who finds their individual shares priced at $.97 with a Market Cap if $157.03M. Some may recall the storied rise of Dendreon which saw shares trade at levels above $50 after their drug PROVENGE(R) received FDA approval as the first autologous cellular immunotherapy for the treatment of metastatic castrate resistant prostate cancer. Like other immunotherapies being developed in this exciting sector, the drug was designed to take the body's own immune cells and reprogram them to attack cancer cells. While we may never again see the type of euphoria that followed Dendreon, biotech traders and speculators know that finding profitable movers involves solid research and recognizing a combination of both value and trade catalysts. One candidate with positive move potential is just starting to find an audience. Seattle based TapImmune, Inc. (OTCBB:TPIV) is by all appearances making good strides in the prevention and treatment of multiple cancers that feature huge market opportunities. Trading volume for TapImmune's shares has started to increase in the last month and a half, as the firm's two Phase I Clinical Trials prepare to progress officially to Phase II clinical status (that catalyst is expected to occur sometime soon, during this final quarter of 2014. Value drivers gain momentum when pipelines progress, but adding to the anticipatory excitement here is the fact that each of the firm's two lead products feature blockbuster potential. The first presents in the form of a HER2/neu breast cancer vaccine and the second as an urgently needed Ovarian Cancer Therapeutic. There are several reasons why an entry point trade for TPIV shares looks compelling now, but none is more evident than the low-risk proposition offered at these price levels. 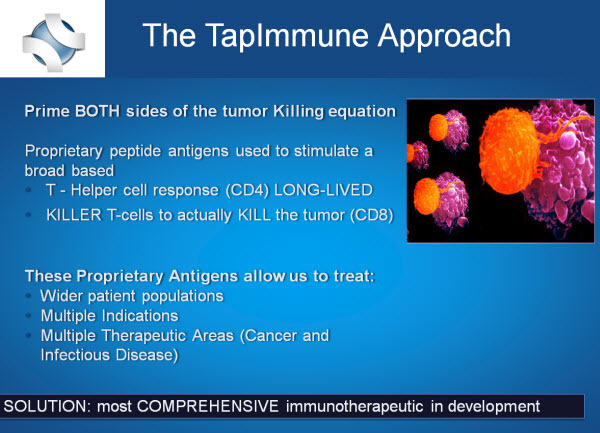 Look again, closely, at the market caps and share prices for some of the immunotherapy developers mentioned above consider that TapImmune shares can be had for a mere $.38 per share. Yes, TPIV is currently priced like an option that won't expire despite the fact that shares traded as high as $7 quite recently. The firm's market cap has been inexplicably punished to a valuation under $8M following a recent corporate re-structure designed to eliminate debt and allow for recent capital raise financings. 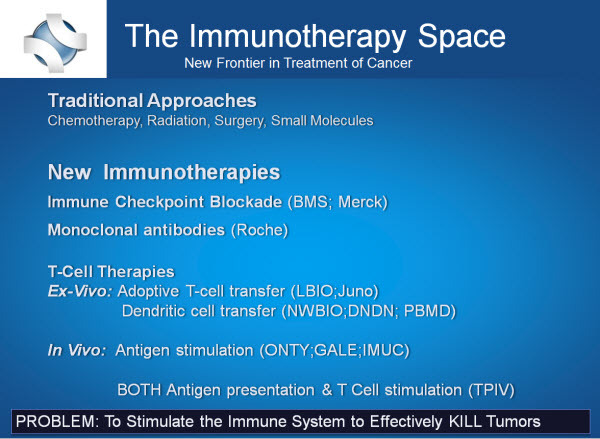 Immunotherapy as a means of treating cancer is the company's focus. By using a patient's own immune system, researchers at TapImmune are able to construct vaccine strategies that they hope will one day prevent cancer as well as prevent relapse after the patient has gone through therapies that are more conventional. The company has two distinct approaches to this goal that greatly differentiate them all the others in the space and their current human trials have showing great promise. In order to better understand the technology that TapImmune is using, it is helpful to have some understanding of the lingo. - Antibodies are a protein found in the blood that chemically bond with foreign substances or antigens. They then respond to and counteract them. - Antigens are foreign substances (such as cancer cells) or toxins that create an immune response within the body and stimulate the production of antibodies. - Epitopes are part of an antigen that antibodies attach to, acting as a facilitator.to promote healing. Peptides are strings of amino acids. While proteins are also strings of amino acids, peptides are smaller. TapImmune's first approach to battling breast cancer is to cause the body to create immunity to a specific tumor. This is done through vaccines that use epitopes from proteins within the tumor that are found only in that tumor. This approach eliminates immunity interference caused by other epitopes that are not related to the tumor. In other words, it does away with the unrelated cells that could cause an immune response and zeroes in directly to the cancer. The other approach that TapImmune is taking involves manipulating the tumor itself and making it more responsive to the body's immune response. There are essential proteins within the body that are produced by almost all cells. These proteins allow the immune system to examine those cells containing them and kill them if they are abnormal or deviant (think tumor cells). By using a technology called PolyStart(TM), those proteins containing cells can be reintroduced into the tumor, resetting the body's immune system and allowing it to effectively fight the tumor. When these two approaches are combined, the outcome can be very effective in fighting cancer. By making the tumor more recognizable by the body's immune system and using a vaccine to create a tumor rejecting response, cancer can be treated in a way that is better and easier. This technology can extend beyond cancer, though. It can be used on many other conditions and illnesses, including infectious diseases. More on that later. TapImmune technology has been used in three vaccine clinical trials conducted at the Mayo Clinic. At this time, two of the trials are complete and have moved to the follow up stage. Participants in the study are now being surveyed and monitored for immunologic evaluation and safety. Data gathered from this stage will provide the basis for Phase II of the human clinical trials. The TPIV vaccines appear to be applicable to a much larger and broader patient population than current standard of care therapies like Herceptin by Roche Pharmaceuticals (OTCQX:RHHBY) which is useful for only 15-20% of the Her2neu Breast Cancer patient population. Keep in mind also that Herceptin (which generated sales in excess of $6 billion last year) is not designed to kill tumor cells (it slows tumor growth). By contrast, the TPIV vaccine is applicable to over 50% of the Her2neu patient population and is also not limited to breast cancer. Her2neu is a target for TPIV in both Colorectal and Ovarian cancer where there are very few therapeutic options. The TPIV Her2neu vaccine conjugate is unique in that it is designed to stimulate KILLER T Cells and the HELPER T Cells that are needed to SUSTAIN the KILLER cells for a LONG LASTING vaccine that kills tumor cells. Published data also supports a 5 fold increase in killing efficacy compared to the development vaccine known as Neuvax by Galena Biopharma (NASDAQ:GALE) whose Market Cap is currently 30x greater than TapImmune's. We sense that the platforms and technologies that are currently being developed through TapImmune's contributions will have a lasting impact not just on cancer research, but on immunology as a whole. TapImmune is making great strides in immunology research and the results, so far, appear to be better than most expected. In addition, during recent corporate presentations management has hinted that various clinical value inflexion points are set to be announced. As a side bet, the firm is also exploiting the emerging field of vaccinomics for the development of vaccines applicable to a broad patient population. TapImmune's immunotherapy technologies are also aimed at the prevention of emerging viral pathogens for pandemics and biodefense. Recent reports point to TapImmune's PolyStart(TM) technology which boosts the effectiveness of existing vaccines on several cancers and infectious diseases and recent company filings on the matter suggest that TapImmune anticipates that further development in this area will be completed through strategic corporate partnerships. The use of non-dilutive grant funding to progress this area allows management to focus the majority of its internal resources on HER2/neu breast, ovarian and triple negative cancers. While further testing and research is required, TapImmune believes that their PolyStart(TM) platform technology is a significant advance in vaccine development and could be applied to almost any vaccine current or in development. This would include in acute outbreaks like the recent Ebola outbreak in west Africa, but also include influenza, H1N1, Dengue, and possibly even Enterovirus. While we believe TPIV shares are significantly undervalued and poised for significant growth, the firm is not without some of the typical risks associated with other biotech's in the space. Like most of these emerging drug developers, financial losses are anticipated while they bring products through FDA approval and commercialization. In addition the success of these types of firms is dependent on raising additional capital to fund clinical trials, ongoing research and other activities in regards to development efforts, maintenance and protection of patents, and ultimately on generating future profitable operations.